Precious children with soiled faces and shabby clothing gathered around our van as we pulled up in Cien Fuegos. “Pastor Ruben”, they called out as he waved hello. In the midst of the small crowd of little ones stood Carlitos. “Carlitos,” called Pastor Ruben, “where have you been?” His eyes became misty as he rolled down the window. “I’ve missed you Carlitos. Where have you been?” His face glowed as he gazed upon this little one. Carlitos was enrolled into our children’s center last year by an aunt. Ruben immediately bonded with him. Each morning he would sit in the corner with a sullen look on his face as the other children sang their morning devotional songs with the teacher. All of our hearts were overwhelmed. Why is Carlitos misbehaving so? We called our late center’s psychologist and explained his behavior. “I’ll be there in the morning,” she calmly responded. We were all shocked when he quickly responded to her. She asked the cook to give Carlitos a plate of food. His face lit up when he saw the plate before him. She urged him, “Sit and eat precious.” He ate. As he ate, she asked him a few questions about his home. “My mom doesn’t love me, I’ve never seen her,” he blurted out with a mouth full of food. At her command, we confronted the aunt. “Why does Carlos come to the center barefoot?”Carmen asked. “We are too poor to buy him shoes,” she responded while starring at the ground. “We are too poor for food,” she responded with a smirk on her face. It was quite apparent she didn’t care much about Carlitos. “Where are his parents?” Carmen wanted answers. At this point, our heats ached for Carlitos. His mom left him with people who chose not to give him better care and there was not much we could do about it. We made it our business to ensure that Carlitos had shoes, clothes, food, an education and knowledge of our loving God. He was faithful to come to the center each day and his behavior improved tremendously as he was fed. Towards the end of the school year, our center director, Isabel told us that Carlitos had not been coming to the center. He’d already missed more than two weeks! After a home visit, we were even more overwhelmed by the fact that his grandmother would not allow him to attend the center because she needed him on the streets to hustle for her. She was unyielding in her commitment to keep him on the street. There was absolutely no desire in her to do what was best for Carlitos. But now, weeks later, he is standing here before us. “Carlitos, where have you been?” Ruben asks once again. He poked out his lips as he usually does before he speaks and tried his best to stand his four year old stature up like the eight year old he is. “My cousin Alex and I are living alone. My grandmother is dying and Alex’s mom is with her. We are alone,” he gazed at the ground. “Have you eaten Carlitos?” Ruben remembered our late psychologist’s advice. “Where is your cousin?” At this point, all of our eyes were misty. How could this be happening to Carlitos on our watch? Twelve year old Alex approached our van. The ringworms all over each of their bodies reflect that reality. We gave them money for food and asked a trusted neighbor to care for them as we needed time to devise a plan. All I could think to do was pray. We wept and grieved over the reality that exists in Cien Fuegos and that reality was smacking us right in our face once again! Carlitos was ours, thus covered by Christ. Satan could not have him; we refused to let that happen. We called on prayer warriors and asked for prayer. Carlitos needed a miracle and he needed one fast! Two days later, as we walked into the center, a young dark skinned lady sat in a chair holding a baby. I smiled at her as I entered and kindly told her that registration wasn’t until next month. At that point, I knew that she was Carlitos’ mother. I pulled up a chair and asked her to tell me her story. My heart fought the desire to hug her and to punch her all at the same time. “How dare she hurt precious Carlitos that way? How dare she leave him with abusers and allow him to suffer abandonment twice?” I thought. I could never resist a nudge from my Master, so I chose to love her. I gave her his words and told her that everything would be okay. I immediately asked Ruben, our center director and our new psychologist to each interview her. We all had to be sure that her story was true. I stood in amazement because that was the same day that I had prayer warriors battling for Carlitos! We allowed her to stay at the center for the day. It was an emotional day for Carlitos and the rest of us. We knew that we wouldn’t see him at our center anymore. His mom lives in a small town that is over an hour away from the center. 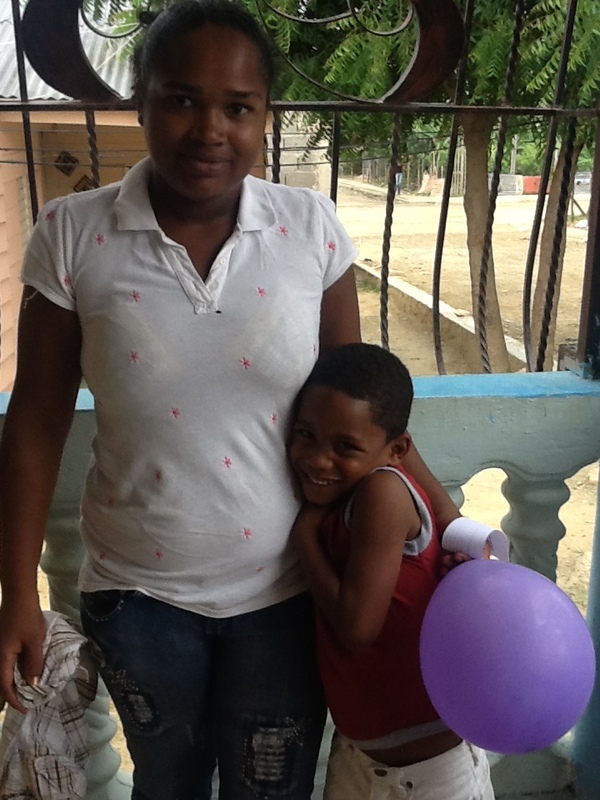 After a play day at our mountain home with the other children from the center, Carlitos happily went home with his mom. She tenderly cared for him in our presence and her love for him is sincere. We promised to visit as often as possible and to be sure that he is handling his new life well. He still needs much care and prayer. As far his cousin Alex is concerned, we have not been able to find a permanent home for him. None of the orphanages that we called will take him because he is already twelve years old. We spoke with his mom and she says she doesn’t care about what happens to him. He is temporarily living with a neighbor who attends our church and works in our ministry. Please continue to pray as the sad stories of Cien Fuegos seem to never end.